Luck is an award-winning international artist and muralist. She has exhibited her work frequently at galleries and museums across the US including: The African American Museum of Dallas, The South Carolina State Museum, and the Heinz History Center Museum in Pittsburgh. She was chosen to receive one of the emerging artist scholarships for the Three Rivers Arts Festival in Pittsburgh, Pennsylvania. She was also honored to be chosen as one of the 25 honorees of the Woman and Girls Foundation’s celebration of Women in the Material World at the Carnegie Music Hall in Pittsburgh. 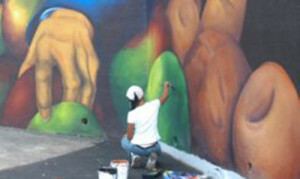 Monique’s work as a public muralist with the Sprout Fund is featured in the PBS Documentary, “It’s the Neighborhoods.” She was also awarded a grant from the Multi Cultural Arts Initiative in Pittsburgh to create a permanent mural Installation in honor of August Wilson. Monique has been the recipient of several awards including: Judges Choice award and Best in Show award at Festival in the Park Charlotte, NC. Honorable Mention, Beverly Hills Art Show, and Best Bearden Inspired Collage at the Mint Museum. Last year she was honored to be chosen as one of Charlotte’s ArtPop artists and received a billboard featuring her artwork. She was also chosen by the Creative Loafing‘s readers as the favorite visual artist for 2014. Currently her artwork can be found at the Harvey B. Gantt Center Museum in Charlotte. • Undeniable: New York House of Art, Brooklyn, NY.